Skateboarding is one of the games that have become a part of the extreme sports, also known as X-Games. It has been around for ages and now newer dimensions have been added to it in order to ensure that the thrill is taken to a new level. One of the ways that you can enjoy this sport and improve your skills is to practice on a halfpipe or a ramp. Making a half pipe or for practicing can be a lot of fun. It will certainly add to the joy when you use one which you made yourself. – Various sized wooden planks depending on the scope of the project. – Ply wood sheets as per the project needs. – Wood panels for supporting the frames. There are many different styles and size of halfpipes, which you can make. Do consider the space you have available and the funds that are at your discretion. Making one too big for the space you have at hand or too expensive can lead to trouble. So carefully consider your options and choose one that is most viable and practical. Once you have decided on the type of halfpipe you want to build, it is time to make a blue print for the ramp. Ideally engage someone who does this professionally or at least is skilled in the field. Even though you can make it yourself, a bit of professional help can certainly help your cause in ensuring that you get the structure planned in the right manner. The base is extremely important and you need to ensure that it is strong and can sustain a fair amount of load. Use beams of solid wood that are approximately six feet in length and place them at a distance of two feet from each other. Connect these beams to the wooden panel. Create a slope ensuring that the surface becomes plain between the two sides of the halfpipe. You will need to use nails as well as super glue for the purpose of making the base structure. The number of beams needed for this purpose will depend on the length of the halfpipe. Once the base structure is in place, you will need to add ply wood to it as a surface material. This will be done by nailing it into the base structure. Get the best quality ply wood so that it holds well in place and gives a great feel to you and your friends when you are skate boarding. 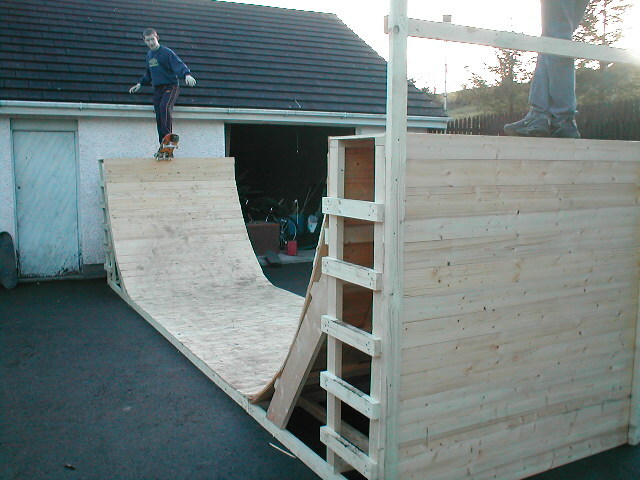 Quality ply wood will also help in having a longer life of the ramp surface. Ensure that there are no loose areas on the surface and it is nailed down properly taking the shape of the base.